The first flight from the UK carrying aid to Burma has left East Midlands airport - 12 days after a cyclone devastated the country. 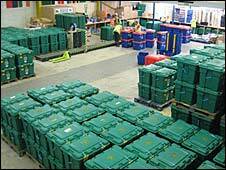 The flight, chartered by Cornwall-based charity Shelterbox, is carrying 1,000 boxes containing tents, mosquito nets, tools and water purifying tablets. Other flights chartered by British aid organisations have been leaving from overseas locations. The Disasters Emergency Committee (DEC) Cyclone appeal has now raised £6m. Shelterbox has received permission from the Burmese government for the plane to land at Yangon airport on Thursday. Two American Shelterbox staff, who have obtained visas, are on the flight along with the aid packages. The United Nations estimate that over a million survivors are yet to receive help, and concerns are mounting amid predictions that another cyclone is forming off Burma's coast. The Burmese government are now giving permission on a piecemeal basis for other aid flights to land. The UK Department for International Development (Dfid) estimates that between 40-45 aid flights have arrived in Rangoon over the last 10 days. But there are serious concerns because the Burmese authorities are continuing to hamper the efforts of aid workers to distribute supplies inside the country. A UN official said the military had erected checkpoints to stop foreigners getting into the worst-affected areas. Gordon Brown, meanwhile, has called on the UN to convene an emergency summit. At Commons question time, he said there has been an improvement in the number of relief planes being allowed in, but it was still "not good enough" because the regime was preventing aid getting to the rest of the country. Conservative leader David Cameron called on the Prime Minister to set a deadline after which emergency aid drops would be enforced. Among the flights to have landed is the first flight sponsored by Dfid, which arrived in Burma on Wednesday. The flight, containing collapsible water cans and tarpaulins to shelter 9,000 families, was loaded from a warehouse in Dubai. Five further Dfid flights are scheduled to fly out this week. Items to be sent include 14 flat-bottomed boats, heavy-lifting equipment to ensure fast unloading at Rangoon airport and plastic sheeting to provide shelter. A Dfid spokesperson said boats were badly needed to get aid safely into flooded areas. The Royal Navy ship HMS Westminster, which has been sent to the region to help humanitarian operations, is also expected to arrive off the Burmese coast soon. The Red Cross have got 10 flights in, with another seven scheduled to leave by the end of the week. DEC, which has 13 members including the British Red Cross, Christian Aid, Concern, Oxfam, Save the Children and Tearfund launches and co-ordinates responses to major disasters. Its appeal has attracted £6m in a week, including contributions from the Queen and Harry Potter author JK Rowling, with the money already starting to be spent. Two large water purification units have arrived and once up and running, they will produce over a million litres of clean water a day. Tearfund say its relief teams have got food, water, shelter and medical supplies to 23,000 people. Christian Aid is aiming to reach 100,000 with blankets, medicines and water purification equipment. Concern's partner organisation Welthunger Hilfe will distribute up to 75 tonnes of rice, as well as pulses, cooking oil, salt, sugar and tarpaulins to 6,000 survivors in the coming days. Dfid estimates that up to 200,000 are dead or missing and 1.5 million are in urgent need of immediate assistance - of which 300,000 are desperately in need. Burmese state media is reporting that 28,458 are dead and 33,416 missing.